Ketchum City Hall was inundated with telephone calls early this week when a half-mile of chain-link fence was wrapped around a two-block portion of Fourth Street and heavy machinery was moved in. The temporary mess is part of construction of a new Fourth Street Heritage Corridor, which after three years of intermittent construction will include wider sidewalks, narrower streets and will run the entire length of Fourth Street, from Spruce to Second Avenue, an eight-block span. Construction of the entire mall should take three years, with this phase linking Spruce to Leadville Avenue, completed by July 4. But that doesn't mean the construction is welcomed. In fact, it could be a considerable hindrance to running business as usual in the meantime. 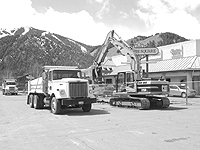 For that reason, there will be a Thursday, April 12, meeting at Ketchum City Hall for local businesses to air concerns and learn about measures being taken to soften the blow of construction. The meeting of the Ketchum Retailer's Alliance will begin at noon. "I want to make sure that, for me and other business owners, that we know what to do and how best to handle this," said Deborah Burns, who owns Burnsi's Bocca on Fourth Street. Burns, who is a member of the Ketchum Planning and Zoning Commission, said the city is paying for signs that will be posted at street corners to advertise businesses that are located mid-block, away from street traffic during construction. "By 11 a.m. today, when I was open, I felt better," Burns said, referring to legwork she did at City Hall in response to the construction. "That's why it's important for everybody to attend this meeting on Thursday, so we can be informed instead of it creating fear and apprehension." Ketchum City Administrator Ron LeBlanc said the transition may be difficult, but information will certainly help. Concerns have "all been very dignified and repressed, and I think people want some information," LeBlanc said. But the work done Monday and Tuesday is only the beginning. An asphalt grinder was scheduled to take to the street today, and work is scheduled to last through much of the spring season. "Tomorrow will be worse," LeBlanc said Tuesday afternoon at Atkinsons' Market, where a backhoe was working in the street outside the window. "The big grinder's coming, and that will be four hours of making a big mess out of the street." LeBlanc said some Fourth Street business owners are unhappy because of the fencing, which blocks access to their businesses. For that reason, the fence location will be adjusted in locations where the need is warranted. "It's a challenge, and there will be some people upset, and we'll work with them the best we can to get the job done," he said. One of the measures that will be undertaken to help soften the impact is that the intersection of Fourth Street with East Avenue will be reopened to traffic at night. In addition to widened sidewalks and narrower streets, the completed corridor will include new red maples that will add a splash of crimson in an otherwise gold valley during autumn. It will include installation of sidewalk pavers, signs and street lights, and the sidewalks, which will be flush with street elevations, will be heated using "green" ground-source geothermal technology. The corridor will also accommodate the city's bike path and include public art and public gathering places. "This is not a pedestrian mall," LeBlanc said during a recent tour of the corridor. "It is still a street." But it will, in fact, be both. LeBlanc said the corridor will hopefully become a pedestrian friendly environment that will encourage people to get out of their cars. "Over time I think the business environment will try to market that," he said. The first three-block phase will cost roughly $900,000, and the entire project could run in the neighborhood of $4.5 million.